Maeven Bride Box is a monthly luxury bridal and wedding planning box. It’s full of trendy items and advice to help with the stressful wedding planning process. Each box includes 5-8 items and the Maeven Intro Box is the first box you’ll receive. This is a review of the Maeven Intro Box. This is some of the loveliest packaging I’ve experienced with a subscription box. Every detail seems to be thought through. The Products: 5-8 on-trend wedding and wedding planning items to help brides during the planning process. A mini magazine full of helpful advice and inspiration is included with each box. 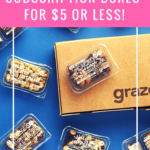 Good to Know: 2, 3, and 6 month gift subscription options are available. A version for Mrs. & Mrs. is also available. Each month, subscribers will receive a mini magazine filled with descriptions of the included items, advice from wedding pros, and real-life inspiration. I’m so impressed by this wedding planner! It includes worksheets for everything you need to keep track of including budget, expenses, guest lists, gift trackers, vendors, and more. There are blank monthly and weekly calendars to help with planning and appointments and even monthly to-do lists to keep you on track. Plus, it’s beautiful and sturdy and will easily fit into a tote. The black marble and gold foil details carry over from the outer packaging and definitely have a luxury feel. This is a perfect inclusion in the Intro Box since this is one of the first items you’ll need during the wedding planning process. Speaking of things you’ll need (or want) during the planning process … Maeven’s got you covered. They’ve included two stemless champagne flutes – one for the Bride and one for the Groom. These have become our favorite champagne flutes mostly because the shape and gold-foil lettering is so pretty, but also because they hold a good amount of bubbly. They’d be great to toast with at the wedding but also are a great way to remember to sit down and enjoy yourself (and your groom) during this hectic time. We didn’t use a cake topper at our wedding, but I would have if I’d had this cute one. I like the simple wood grain and darker, laser cut edges. It’s really lightweight and the size (5″ wide & 4″ tall) would be great for both larger or mini cakes. Again, this is one of those items that is useful to have at the beginning. It could be used at parties, showers, or at the rehearsal dinner too. This is such a great idea! In all the craziness, John and I completely neglected to take time to write something special to one another for our wedding day. These cards are beautifully packaged and well-made. The envelopes and interior of the cards are blank but the outside has a nicely designed text that says “To My Bride/Groom On Our Wedding Day.” You can store these and other keepsakes in the beautiful white keepsake box that all of these goodies came in. Ok, I’m going to geek out about the packaging again. I’ve never seen a jewelry holder like this. It looks like the same laser cut wood from the cake topper except that it’s holding this beautiful rose quartz necklace. The necklace is long, about 29 inches, and has a 2.5″ extender. The rose quartz stone is held by a shiny gold band and is simple and chic. Not only does it look fantastic in this package, but it is a versatile piece that can be worn alone or layered. This matte bottle opener is about the size of a credit card and has a brushed gold finish. It would look great on the bar at your wedding, especially if you do self-serve like us) and is also a great addition to a drink tray at home. This is also a great idea for party favors or gifts for the bridal party. After serious sessions of planning, one of the best things I did for myself was to take a hot bath. These are perfect! Himalayan Pink Salt and Rose Petals make for a relaxing bath that is also pretty. The scent of roses get a little stronger as the petals soak, but it is still subtle. Verdict: If you can’t tell by now, I love this box. I thoroughly enjoyed opening it and the packaging is probably the nicest and most visually appealing of any box I’ve seen. That makes me think this would be a stunning gift for a bride to be or even a wonderful treat for yourself. All of the items are high quality and I’m so impressed with how well thought out the curation is. Everything, starting from the box it came in (keepsake box), has a purpose and a helpful role in the wedding planning process. I went through the planning process for my wedding last September and I would have been thrilled to have this box to help me then. Since every subscriber receives this box as their first box, you can plan on having everything you need to get started. I can’t wait to see what the next Maeven Bride Box holds for me. Can you still get this box if you sign up today? Yes! If you sign up today (or any day) this will be your first box. After this Intro Box, you’ll fall in with the monthly theme each month. Value Breakdown: At $51.90 ($44.95+ $6.95 shipping) each of the 7 items has a value of about $7.41. Check out all of our other bridal subscriptions in the Bridal Subscription Boxes for Women List! What did you think of Maeven Bride Box’s “Intro Box”? How do subscribers rate Maeven Bridal Box? Do you subscribe to Maeven Bridal Box? Add your rating now! I’m not getting married but this box is beautiful. If I hadn’t purchased an Erin Condren wedding planner that is very similar to the one you receive in the welcome box I would totally sign up as I would love to get this box while planning my wedding for next July. I’m not getting married yet I want this box. It would be swell to add this box to swaps! Do they have a queer version of this or is this box only available to heterosexuals? I was going to ask the same question. I think it would be a much better box if you could customize it. My fiance and I are starting to plan our wedding and it is disheartening to not have a bride & bride option out there. When you click subscribe you actually choose between Mrs./Mrs. or Mr./Mrs. So they do have the option then? So, I would receive everything customized to say bride/bride? Hey girls! Maeven here 🙂 We offer all subscriptions with a Mrs/Mrs option. In the intro box you would receive two bride flutes, a Mrs & Mrs cake topper and two bride cards! I love that planner! I wish i could find a non-wedding, regular planner in that same style and color scheme. I like the idea of this box. I really think the planner is fantastic. I would have loved to have one when planning our wedding.